Tomatoes, and beans, and cukes, oh my! Late August and early September has become one of my favorite times in the last few years. Yes, I’m happy to see my children off to school, but that’s a post for another time. I really enjoy this time because my garden is in full bloom. Historically, I have not been good with plants. Okay, I’ve been downright awful. People would hesitantly give me houseplants, knowing they would likely never see them again. I am well aware of my black thumb reputation, but I decided a few years ago that gardening would be the perfect challenge for me. I could attempt to learn more about gardening, put it into practice, and try to turn something I was really bad at into something I was good at (or at least marginal). I went to gardening seminars at the library, I read books on Square Foot Gardening, and I made a plan. I started out with a small 3 foot by 3 foot raised bed garden next to my house so that I was sure to notice each day if it was being neglected. That first year, I grew some lettuce, tomatoes, and herbs. Not bad for my first try – what I did grow was quite tasty and fresh. Over several years, I built more planting beds, and tried more vegetables. Some worked, and some didn’t. I made it a group project, recruiting my kids to plant seeds, water plants, and harvest vegetables. We tried growing small watermelons one year, but they never got red. We planted a small group of new potatoes, and ended up with a bumper crop. So this year, we planted a whole box of potatoes! 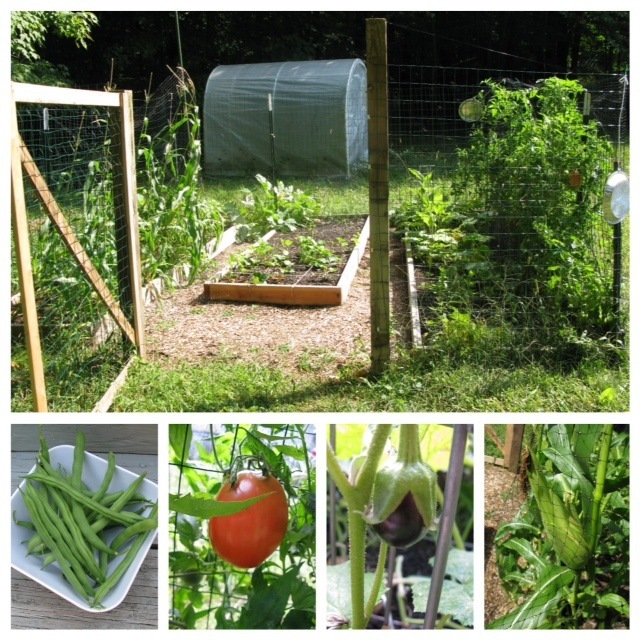 It’s amazing to me how much vegetables can grow in one day. Each afternoon I check the garden, and new surprises are waiting for me. Eggplants have turned from buds to little shiny purple orbs. Tomatoes have turned from pale yellow to bright red. Long, fat green beans have grown ready to eat seemingly overnight. Today I noticed that a few vegetables I planted next to each other have decided to grow intertwined with each other. Cherry tomatoes have grown to the left, super saucer tomatoes have grown to the right, and the pole beans in the middle are giving all of the tomatoes a loving hug, holding everything up along the trellis. I could try to separate them, but what’s the point? They seem to be quite happy. So whether you grow vegetables, or flowers, or just try to keep up with the grass in your yard, enjoy these last weeks of sun and green before the cool colors of fall arrive. And if you are so inclined, intertwine your life with someone else’s (even if it’s just a hug or a show of support). You’ll be so much happier for it. Thanks for allowing me this diversion. I’m hoping the lessons of my garden find their way into my writing. I’m hoping for a fruitful writing harvest soon! We live in a super-sized world. We innately believe (with a little product marketing help) that things are better when they are bigger, taller, more extensive, or more expensive. But that’s not always the case. The Harry Potter books aren’t great just because they are long. To be great, they also have to be engaging, creative, and suspenseful. For a book to be superlative for you and other readers, it has to connect with you, regardless of how many pages it is. Do you remember special books that you loved, and read over and over again? I’m sure they had many characteristics in common, but I bet page count was not one of them. I was reminded of this a few weeks ago when planning a trip to the zoo with my kids. 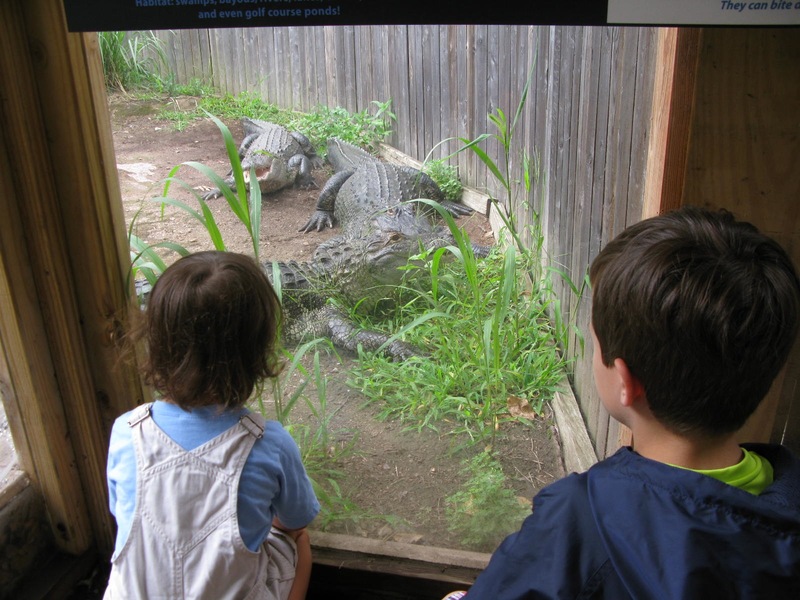 I had originally planned to take them to the Bronx Zoo, which is a full day trip for us and isn’t cheap. It’s a wonderful zoo, and we have loved all of our other visits. But due to the threat of rain, I decided we would try our state zoo instead. 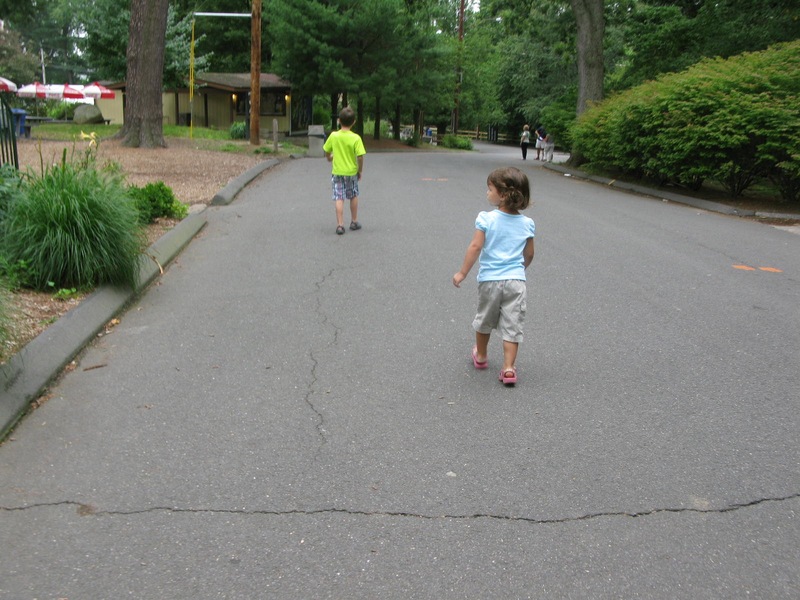 It is much smaller than the Bronx Zoo, but it was perfect for that day and this time in my children’s young lives. We explored the whole zoo in 2-1/2 hours, seeing plenty of exciting animals including tigers, alligators, and a little bird who wanted us to take him home. It was surprisingly fun, and just the right size for two young kids and one tired mommy. It was a quality zoo, regardless of its size. And we connected with it, going back to see the tigers (our favorite) again and again. We’ll certainly be back to the Bronx Zoo again some time, but I’m glad there’s also a place for the smaller, charming, quality experience. Earlier this week I read an article by Rachel Macy Stafford which really struck a chord with me. In the article she talks about an “aha moment” where she realized what she was missing by rushing through her day, moving from one thing to the next on her list. I love being busy. I love the feeling of falling into bed at night feeling accomplished and bodily tired from the efforts of the day. My husband and I have spent the last 9 years renovating our 1975 Colonial home, so there have been many weekends and week nights full of planting, weeding, painting, hammering, tiling, and framing. However, it is a daily struggle to balance spending time with my family, reading, writing, time for what needs to be done, and time for myself. There just aren’t enough hours in the day. This article reminded me as summer winds downs to take advantage of every moment. To enjoy my children at this age. To feel the wonder of harvesting vegetables from my garden. To be open to the experiences that may never come again. Those are the things that will drive my writing- not the loads of laundry and the dust piling up on my furniture. The chores and errands still need to get done, but they will certainly be here tomorrow. 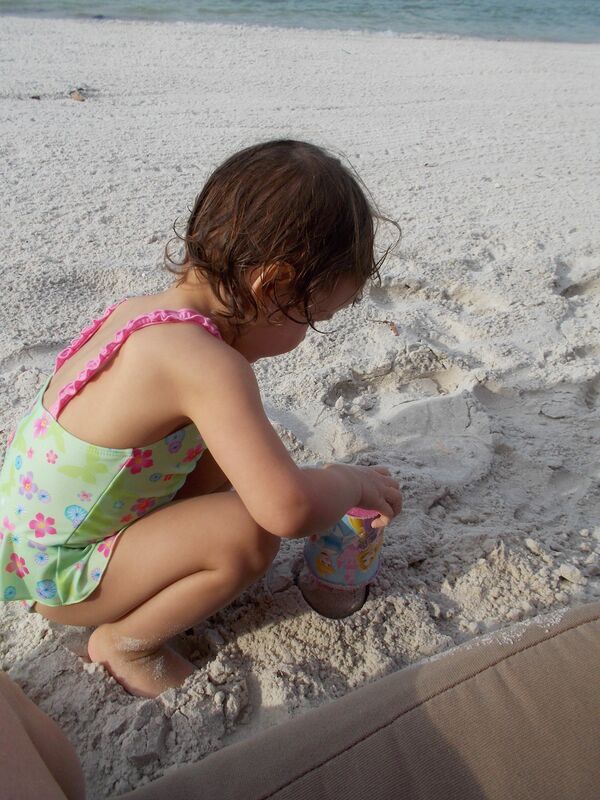 During the summer months, my children enjoy exploring theme weeks. We plan some activities and at least one adventure around topics they are interested in. This summer, we are learning about different parts of Earth and space. We had a packed week along with some family friends learning about space: learning each of the planets (I still say Pluto is a regular planet, darn it), making rocket snacks, putting on alien temporary tattoos, and producing a space movie. This week we’ve been learning about the oceans. Earlier in the week, we joined some friends at a local beach on a lake. It was lovely – much sandier than most lake beaches I’ve been to. The kids and I talked about how a lake is different than an ocean: salt water, tides, waves, etc. Today we visited the real thing – the ocean. The kids were beside themselves with excitement. We spent the morning playing in the waves, making sand castles, and generally getting sand everywhere a body can hide it. On the drive back, as I peeked at my two sleeping angels (As hyper as they are, they really do look like angels when they’re asleep. That is, if angels snore. ), I thought about our adventures for the week. So here’s the metaphor for this week: writing stories can be like water. Fundamentally, it is still water wherever you find it, but it feels different depending on what form it takes. Your story might be a picture book, or a middle grade novel, or a short story, but in each of these forms the story feels different, as the ocean feels different than a lake. My first middle grade novel has just finished a big revision cycle, and once Joanna can read it, it’s off to some agents. Let’s hope some lucky agent likes oceans as much as I do.